Hope everyone had a great Thanksgiving! We have a couple of pretty veggies coming this week, in the form of multicolored carrots (kids love eating purple carrots) and watermelon radishes, which are red on the inside and green on the outside. Here’s the full list. Watermelon radish salad with cilantro – This lets the pretty radishes shine. Sub your lettuce for the romaine. Also, instead of the avocado dressing originally called for, whip up a citrus vinaigrette with some tangerine juice, olive oil, salt, and pepper. I bet throwing in some tangerine sections would be good, too. Bok choy, carrot, and green bean stir-fry – I’m taking this general idea and heavily adapting it. Double the ingredients (the recipe says it serves six, but, looking at the amounts it calls for, I don’t buy it). Add more soy sauce. I’m also going to up the protein content by stir-frying cubed chicken or pork (seasoned with salt and pepper) before adding the veggies, so you’ll need to use more oil. Tofu would be yummy, too. Finally, I’ll probably throw in some chopped cilantro at the end, and serve everything over brown rice or another whole grain. Hot wilted greens – Add chopped Italian peppers to the onion mixture. I love the addition of balsamic vinegar and pecans here. My sister-in-law introduced this recipe to us last Thanksgiving. 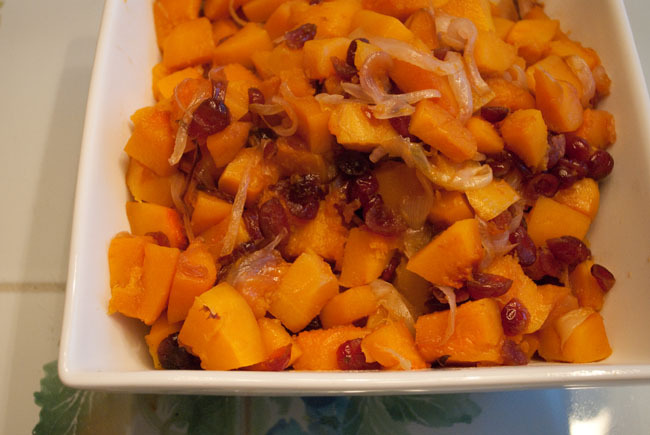 It’s a simple combination that I’d never have thought of on my own: butternut squash, cranberries, and onions. Season lightly, bake, and voila! You have seasonal side dish that would taste good any time of the year. 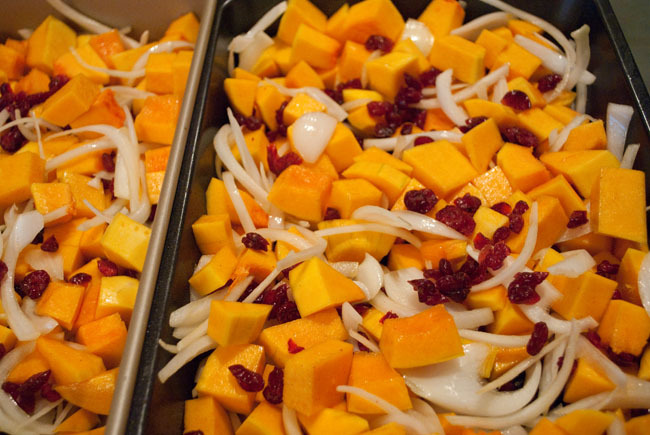 In a bowl, toss squash and onions with 1 tablespoon of olive oil and seasonings. Combine with cranberries and spread in a baking dish. Bake 1 hour. Pour cranberry juice over squash and put back in oven for 15-20 minutes. What else do you do to be Green? Send us pictures or stories of what you’re doing to better the planet and we’ll give you $5 off and highlight you on our website!